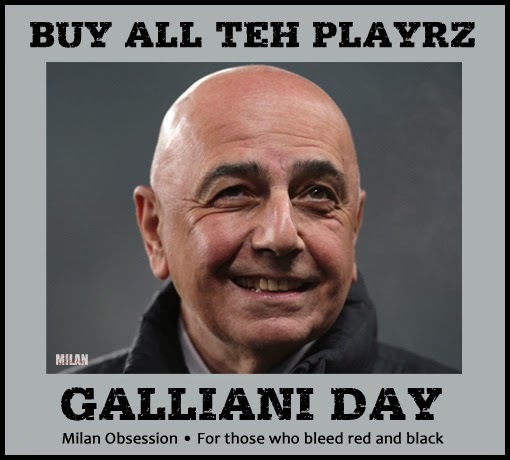 Despite the final hours of the wacky sideshow that is the mercato and the distraction that is Galliani Day™, the main event is actually our match with Torino on Saturday night. And while I can confirm that there has been interest in me from other clubs this mercato, rest assured I have absolutely refused to even entertain any offers. 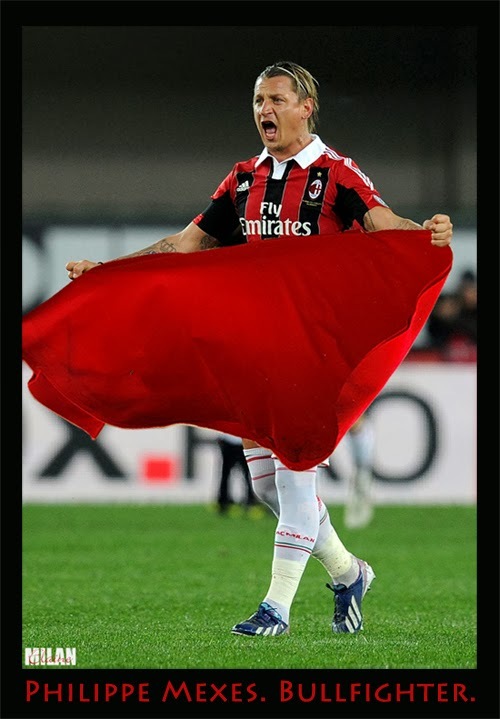 I have a contract of the heart with Milan for life, and I will fulfill it. Even if we play poorly on Saturday. You know, that football match that we are supposed to be focusing on. Will our favorite matador of the past even be at the club still on Saturday? In September, we drew with Torino in their house, 2-2. Since then, much has changed. Torino sit in 6th place, and Milan are only 4 points behind them in 9th. We have a new coach, and some new players, too. In fact, if Galliani has his way, we will have a gaggle of new attacking midfielders, with Honda having arrived and the never-accused-of-being-classy Taarabt, who is taking his medicals as I write this. But that is not all. Torino just sent their left back D’Ambrosio (who Milan had shown interest in) to Inter, which was kind of them to do two days before we met them again. Thanks, Torino. But I digress. The main event is supposed to be the game, right? Okay. So Torino have a current form of W-L-D-W-W, with the latest win being a 1-0 victory over Atalanta at home last weekend. A penalty scored by Cerci was the deciding factor in that game, where Ventura lined up Padelli; Maksimovic, Moretti, Glik; El Kaddouri, Farnerud, Masiello, Vives, Darmian; Immobile, and Cerci. It would appear that barring any other last minute transfers, Ventura has largely a full squad, missing only Gazzi to injury right now. Will Torino's known criminal be rehabilitated? Or will he send more Milan players to the injury list? Of course, another sideshow to this game is Balotelli’s ban for his salute to the racist fans last week at Cagliari. But for once, we’ve got the situation under control, as Pazzini is back to scoring ways and will likely punish il Toro better than a matador. Our injury list seems to be getting shorter, with Zapata, Zaccardo, El Shaarawy, Saponara, and Silvestre seemingly still on the list. And the list of those with the flu seems to have vanished (that I know of) as of this writing. 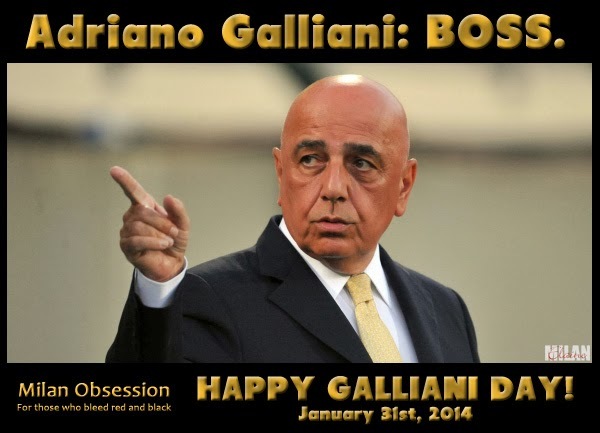 Now it will be a matter of who is still at the club at the close of Galliani Day™. But with Zaccardo being like the wallflower at the dance whom no one wants to dance with and Constant snubbing a miraculous Napoli loan offer in hopes of a permanent move, it’s hard to know who will still be in Milano on Saturday to play. 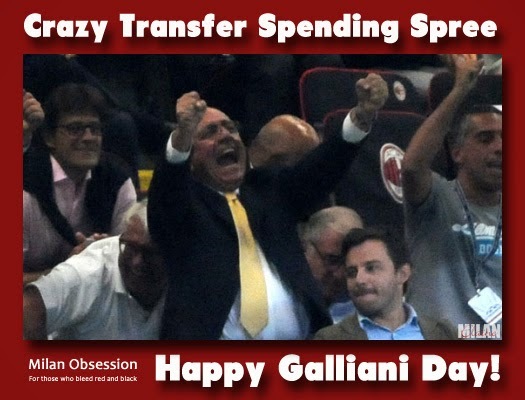 Amidst the mercato circus and what is shaping up to be potentially the worst Galliani day™ since the tragic Matri signing of 2013, Seedorf has to keep his squad serene and happy (which is more than I can say for the fans after the ridiculous Taarabt deal.) He should have Abbiati back from the flu, which should allow for a slightly lower intake of alcohol by fans ahead of this match. 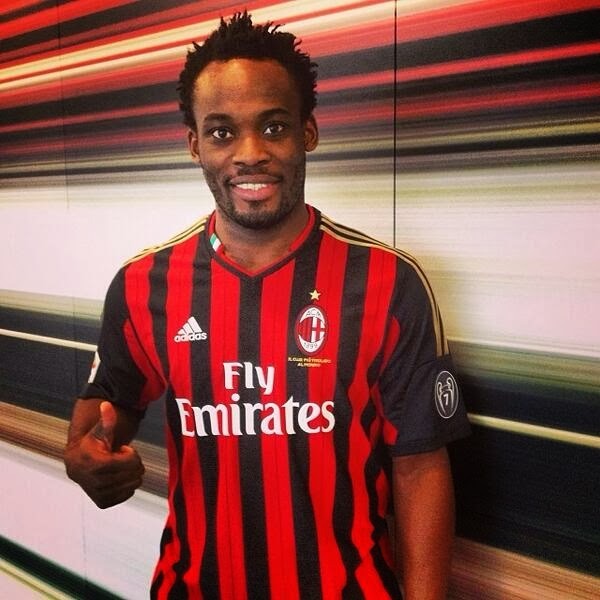 He’ll also have the great Michael Essien available to him, with his Wonder Knees™ (as in “I wonder if his knees will last through this match?) We will see a true test of Seedorf’s loyalty to his friend and former teammate vs. his desire to continue to coach for any length of time if he starts Bonera again or not. Beyond that, I will let you guess the lineup amidst everything else going on right now. This match will be a very good test to see Seedorf’s progress with the squad. While it is clear that morale is returning, learning the new system will obviously take longer. And while it is clear that we have a lot more talent than showed under Allegri’s reign of terror the rest of the season before now, it is also clear that you can’t teach an old dog new tricks with some of our players. But I am hopeful that the home advantage will be helpful. Hopeful that the Curva will show up, if nothing else to protest the Taarabt transfer and the whole bizarre sideshow that is our mercato this time around. But mostly I just want the win. Not only for DeekMonn’s birthday, but also for the three points and the morale boost it would be for the squad ahead of our trip to the San Paolo next week. So with so much bull sh*t happening in the mercato, let’s go fight some bulls on the pitch. After all, it is the main event. This match will be shown LIVE on BeIN Sport and RAI in the U.S. 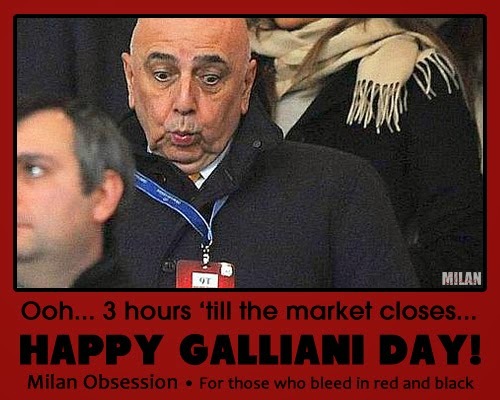 Send a Galliani Day™ Card to a friend!